The all-new highly-anticipated 2014 Audi RS 7 is coming later this fall and will be the most powerful RS that Audi has ever produced. Will Audi be able to catch BMW? If you are a fan of high-performance, there are more good things coming from Ingolstadt, Germany. Audi is expanding its lineup and it’s getting faster and more powerful than ever. As a part of their global growth strategy, the German automaker is allocating $14 billion through 2016 to modernize and expand their portfolio of products. Audi said it wants to sell more than 2 million vehicles annually by 2020 in a bid to overtake BMW. The new performance 2014 Audi RS 7 is a major key in Audi’s attempt to run BMW off the track and move into first place in the global luxury performance wars. Audi has just announced their 2014 lineup and it will include more performance than ever. To compete with BMW and Mercedes, Audi takes a big step forward with the new RS 7. The track-tested RS 7 has been highly anticipated and will be the most powerful RS Audi has ever produced. The new sedan should excite U.S. performance enthusiasts as Europe seems to get these hot models and American drivers get left out. But the new RS 7 will launch here in the U.S. sometime later this fall. The RS 7 Sportback was revealed to the world at the 2013 North American International Auto Show and is the newest addition to the growing RS family here in the States, following on the heels of the TT RS and RS 5 coupe and convertible. The highly-anticipated RS 7 is built with the twin-turbo 4.0-liter TFSI V8 engine, producing an astounding 560 hp that launches the RS 7 from 0-60 mph in just 3.7 seconds. All that power will be transferred to the wheels via an RS-tuned eight-speed automatic transmission. It will have an electronically limited top speed of 155 mph. But available Dynamic or Dynamic Plus packages raise the ceiling to 174 and 190 mph, respectively if you can find a track long enough here in the U.S.
Audi is also expanding the A7 model line with a new TDI clean diesel variant, the first five-door clean diesel coupe. Like the A6 TDI, the A7 TDI provides a powerful 240 hp and 428 lb-ft of torque with an outstanding EPA estimated fuel economy 24 city/ 38 highway/ 29 combined MPG. The A7 3.0T and TDI both start with the Premium Plus equipment level, which comes standard with a host of technology features, such as Audi Navigation plus with Google Earth and Audi connect analogous to the A6. 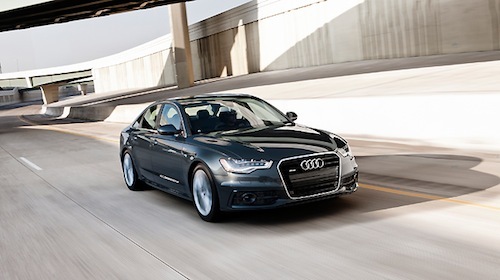 For 2014, A7 variants are now five-passenger cars, while the S7 and RS 7 are offered exclusively in a four-passenger configuration. Pricing hasn't been announced, but expect to pay much more than the 2014 Audi S7's $80,200 MSRP. But it will be well worth the price for what should be an insane driving experience. More information on the RS 7 will become available in the coming months ahead of its U.S. on sale date in late fall 2013. Ultra-performance fans here in the U.S. can rejoice. Watch 2014 Audi RS 7 from YouCarPress video.